Alums galore this past Friday. Ryan '14, Thomas '13, George '13, Connor '13, John '12 and Miguel '12 all stopped by the office to catch up and say hello. 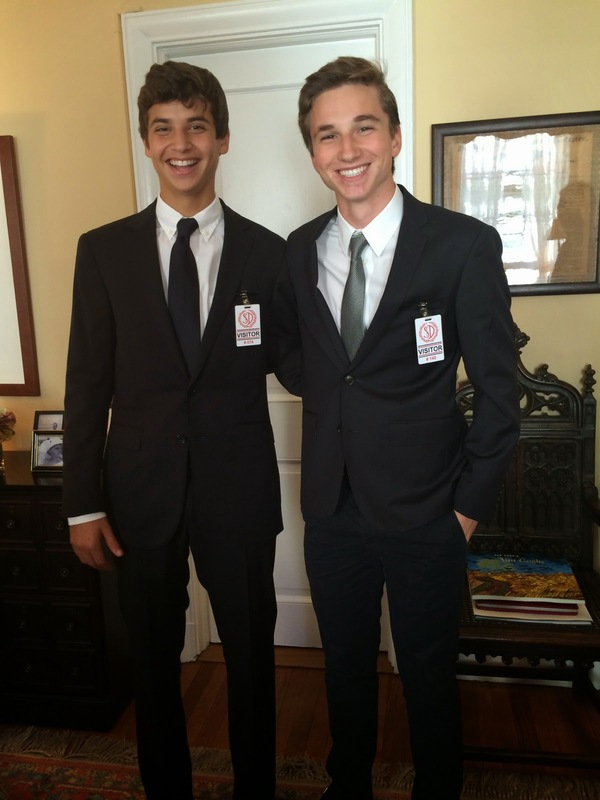 Ryan's at Fieldston, Thomas and George, Riverdale; Connor, Bronxville; Johnny, Loyola, and Miguel is at Grace Church. The boys are all enjoying high school. Apparently, Johnny is the finest goal keeper Loyola's ever seen, or so I'm told, and Miguel is the star starting pitcher for Grace. It was fun to see them all. The following article by Modern Languages Chair Tori Gilbert and Head Coach Jorge Roman appears in the summer 2014 issue of Saint David's Magazine. A few years ago Saint David’s began, through the Curriculum Initiative, the rollout of our school-wide Spanish language program. The rollout was completed last year, enabling our boys to study Spanish throughout their tenure at the school, from Pre-K through Grade Eight. In the spring of 2008 Headmaster O’Halloran began discussing with us a possible immersion experience for the boys in a Spanish-speaking country to augment and deepen what they learned at Saint David’s. We began our search broadly. Our investigations ranged from South to Central America and finally to the cradle of the language of Castile—Salamanca. After traveling to Salamanca in the summer of 2009, we explored what options would be possible for a relatively young group of boys to experience immersion within the traditional travel safety boundaries set by Saint David’s School trips. The school’s administration was able to work in partnership with the University of Salamanca, the provincial government, and the local schools to create a customized program just for our boys. 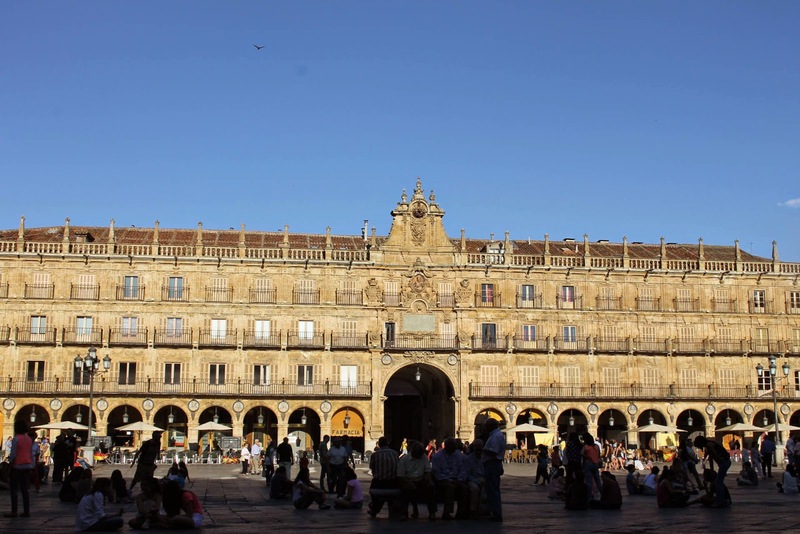 We were satisfied with the small town feel of the city, the talent of the teachers who would work with them, the comfort of the facilities, and most of all with the proximity of the extraordinary, world-renowned historic sites and opportunities that studying in Salamanca affords. 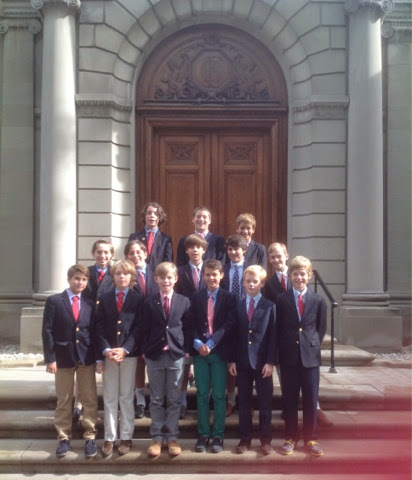 Through our new collaboration with the Frick Collection, a group of our sixth grade boys and their art teachers made their first visit to the Frick today. Led by museum guide Olivia Birkelund, the boys viewed master portraits in the Collection that related to specific topics they are studying in various disciplines, and which helped inform their understanding of the genre throughout time. Works viewed included Joshua Reynolds' portrait of General Burgoyne (boys are studying 18th century American history); El Greco's portrait of Vincenzo Anastagi, Bellini's Saint Francis (a Saint the boys are very familiar with, and they will visit the Basilica in Assisi during their Eighth Grade Italy Study Tour), Holbein's Saint Thomas More (a reproduction of which hangs in our library), and Jean-Auguste-Dominique Ingres' portrait of the Comtesse d'Haussonville. Later in the term, when the boys create self-portraits in 'line and watercolor,' they will most certainly draw upon lessons learned today. Saint David's is purposefully increasing these types of collaborations with cultural, educational, and scientific institutions throughout our city. Such learning beyond the classroom walls exponentially expands the palette from which our boys can explore and bring meaning to skills and concepts learned in the classroom, and the world around them. Our third grade boys are in the midst of a new electronics STE(A)M unit, using Little Bits kits. Yesterday, they experimented with using a pulse bit to change the speed of the electronic signals that cause an LED to blink. Using a power bit, power source (battery), pulse bit, and vibration loader, the boys had great fun experimenting with their devices and collaborating with each other. They were delighted when, through successful connection, they heard the pulse beats and saw the light blink, indicating the flow of electrons and their speed of travel. In units such as this, we are guiding our younger boys to be creative idea-generators and collaborators. This year Saint David's has increased the number of science periods each week in Grades One through Three, and we are folding technology into the science curriculum through a new STE(A)M strand that allows us more opportunity to teach active, collaborative problem-solving skills. A short video clip follows too. 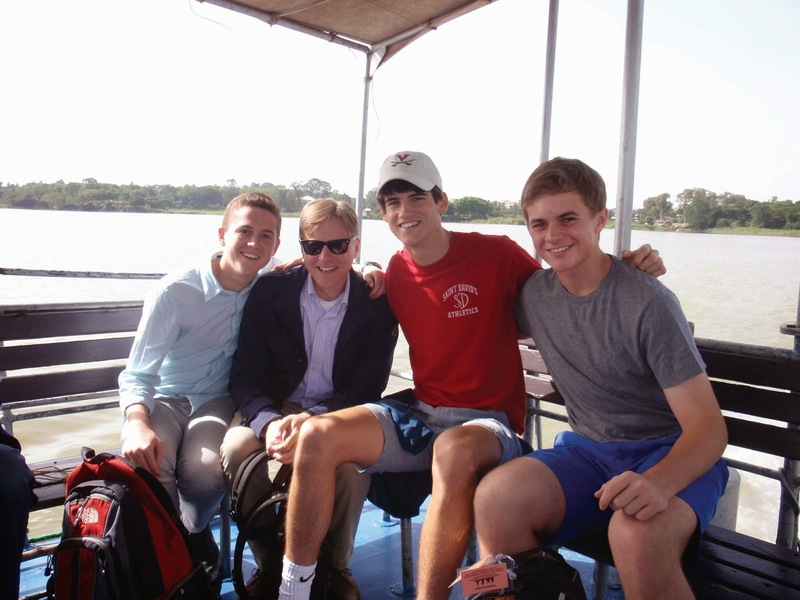 On Lake Tana, Ethiopia, with three former student council presidents. Inquiry-based learning abounds at Saint David’s. An active approach to education, it emphasizes investigation, collaborative and individual work, hypothesis generation and testing, and experiential-based problem solving, research, and analysis. This aspect of true learning has always been at the heart of a program rooted in rigorous academic pursuit and it is one very much encapsulated in this past year’s school-wide theme, Critical Analysis. Examples of inquiry-based learning can be found in all disciplines at Saint David’s: in our new Fifth Grade DNA unit, taught in partnership with the DNALC of Cold Spring Harbor, and in the Sixth Grade’s research and exploration of primary source documents through our partnership with the Gilder Lehrman Institute of American History; in the Seventh Grade Spanish immersion with the University of Salamanca in Spain; in the new “Critters” STEAM project that seventh graders participate in while on Cape Cod; in our multisensory approach to reading in the Lower School; and in the role-playing of fourth graders as they “travel” the Silk Road. Throughout our program, Saint David’s boys learn in ways that are engaging and captivating; ways that require them to analyze the world around them critically, and to apply their findings thoughtfully in their lives. On so many fronts, Saint David’s is deliberately reaching out and connecting with cultural, educational, and research institutions through formal, strategic partnerships that expand the boundary lines of a Saint David’s education. It is rarely possible to solve problems or overcome challenges without the help and expertise of others—effective critical analysis requires an open mind, collaboration, and a multi-perspective view. 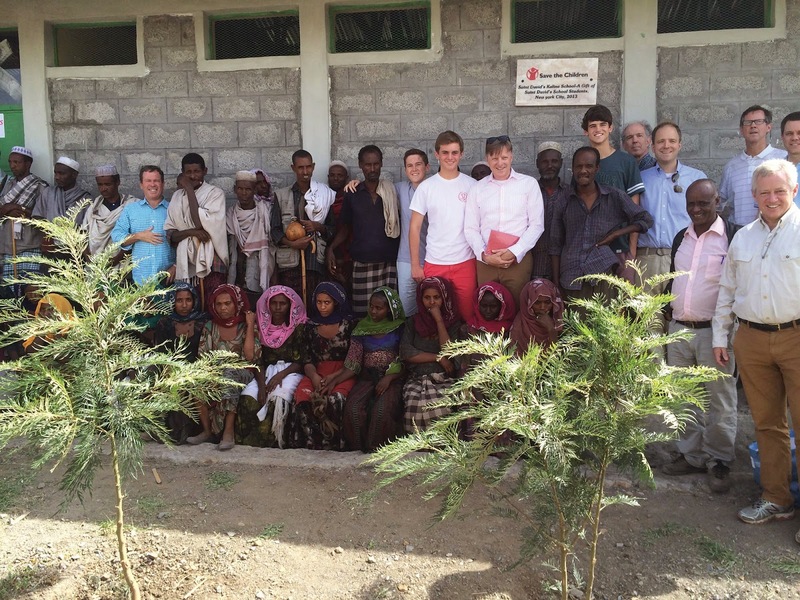 The opening of the Saint David’s Kalina School in Ethiopia is a perfect example. It was the result of a critical reflection on the school’s mission, the identification of an important issue, the development of a strategic partnership and then, through dedicated hard work and perseverance, the achievement of the goal. The following article by Upper School History Teacher Joe Shapiro, appears in the summer 2014 issue of Saint David's Magazine. "Wait, this is real too?” asked another astonished Sixth Grade student as we examined Ulysses S. Grant’s presidential razor blade (complete with a permanent blemish from the President’s thumb). “If this isn’t all real . . . I’m in big trouble,” responded one of the chief archivists of the Gilder Lehrman Collection. 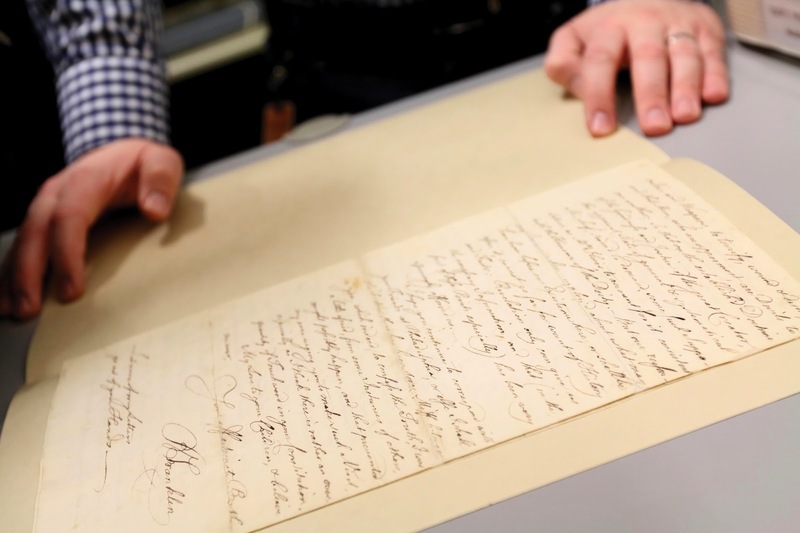 It was founded in 1994 by Richard Gilder and Lewis Lehrman who have spent the last two decades adding to the collection of American historical documents, which is now home to more than 60,000 “letters, diaries, maps, pamphlets, printed books, newspapers, photographs, ephemera” (and at least one razor blade). Gilder and Lehrman have ensured that pieces of American history do not simply collect dust in a random assortment of nooks and attics, but rather that they come alive in classrooms where wide-eyed, budding historians are waiting to dust them off. Saint David’s recent Curriculum Initiative sought to increase opportunities for boys to expand their learning outside the classroom. The Sixth Grade history curriculum, which is the culminating year in a two-year American history sequence that begins in Fifth Grade, offered the perfect opportunity to take advantage of the primary sources of the GLI collection. Primary sources—essential tools for all historians—are especially important to fostering a passion for history in our boys. Because their content can often be shrouded in difficult language, they offer an immediate challenge to students. Saint David's teachers are always on the lookout for ways to integrate technology with everything they do, when and where appropriate--and they are great about sharing best practices and other findings with each other! At the end of the 2013-2014 academic school-year, several teachers participated in a technology showcase at Saint David's, where they shared the innovative ways in which they had integrated technology. All faculty were invited to visit the showcase, where they observed and discussed the rationale, strategy, and results of integration with the showcase presenters. Among the many inventive ways technology was integrated, a few highlights included: the inclusion of Bee Bot robotic programming in the First Grade social studies mapping curriculum, an i-Pad “virtual reality” scavenger hunt used in Spanish classes, and 3D printing in Upper School math classes to investigate surface area and tackle urban planning challenges. As this new school-year of “Ideas and Ideals” gets fully under way, our teachers will continue to fold technology into curriculum in meaningful ways. One way we are doing this is by increasing the number of science periods each week for our Lower School boys, allowing them the opportunity to generate ideas through collaborative problem solving in STEAM strands. The following article appears in the summer 2014 issue of Saint David's Magazine. It was not anything like I expected. In the early morning hours of June 14, 2014, a Saint David’s contingent stepped out of the terminal building at Bole International Airport in Addis Ababa. Expedition Ethiopia had landed. It was cool. There was a light fog about, moisture hung gently in the air, and there was the crisp smell of eucalyptus—a pungent aroma intensified whenever the air is stretched to its extremes by either heat or moisture. I found myself immediately transported by this distinct scent to another place and another time. I felt young again. The feeling of placing an anxious foot in a foreign land was replaced with a nostalgic step back to a place I knew. Growing up in Australia, the aroma of fresh, wet eucalyptus at the dawn of a new day woke the heart from its nighttime slumber. It made the blood run. What Australians colloquially refer to as the gum tree, the eucalyptus was brought to Addis in the early 1890s by the Ethiopian Emperor Menelik II, the first king much loved by all the Ethiopians. A fast-growing tree, it would fuel his new capital. Even today we watched wide-eyed Ethiopian women, and sad-eyed donkeys haul the heavy loads of wood down the Entoto Mountains to sell at market. This daily collection and procession has defined the ‘new’ capital’s northern limits for more than 150 years. It was from the airport that we immediately ascended these mountains and surveyed the city below. Addis is filthy but exhilarating. Bipedal locomotion dominates as the principal mode of transportation, but scattered about are tri-wheeled Fiats, leftover gifts of the imperial minded Italian conquerors of the early 1900s, lorries and VW combos stuffed full of people, and 50-year-old blue and white taxis that somehow, by the grace of God, still run. It is a thriving, bustling metropolis—frayed at the edges, a little tighter in the center, but chaotic throughout. There are traffic lights installed at some intersections, but they are not turned on. Every crossroad in Ethiopia, it would seem, is negotiated and negotiable. Addis Ababa is wild, edgy, dangerous, but remarkably, it all somehow functions. It was indicative of all that followed. 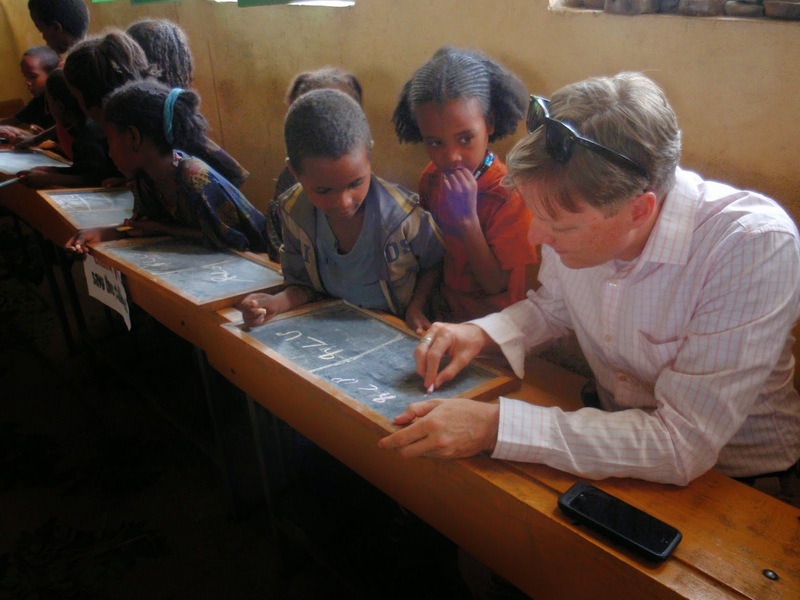 At the Saint David's Kalina School in Tigray. The Kukufto Village chief elder, an old, wise, weather-worn faced Ethiopian said only one thing to me at the end of our formal ceremonies at the opening of Saint David’s Kalina School in June: “I only wish I was young again, so I could attend this school.” An illiterate man, he sees the promise and challenge of the future as clearly as the Abyssinian sun shines brightly in his sky. 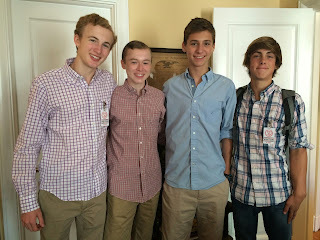 Trekking the Horn of Africa at the opening of my summer with three student council presidents, their dads, and teachers was nothing short of inspirational. Eucalyptus, frankincense, and myrrh invaded my senses while the ideals of life, liberty, and the pursuit of happiness consumed my thoughts. Along unpaved, rut-filled roads to villages and towns with no running water, indoor plumbing or septic systems, the Ethiopians are laying high speed Internet cable to earthen floored huts that leak in the rain. Forget the whole Industrial Revolution; Ethiopia is moving from the Agrarian Age directly to the Information Age. Like enlightened parents in New York, enlightened parents in Ethiopia see a dramatically changing world. Their children’s future as well as our children’s depend on accepting and adapting to this reality. Ideas will be the engines that drive the future. With technological advances unfolding at speeds that not long ago would have seemed unfathomable, those who generate the ideas now stand to reap a greater percentage of the rewards. In a provocative piece in a recent publication of Foreign Affairs, the authors argue that digital technology is reshaping our economy and, by extension, our work and world (1).